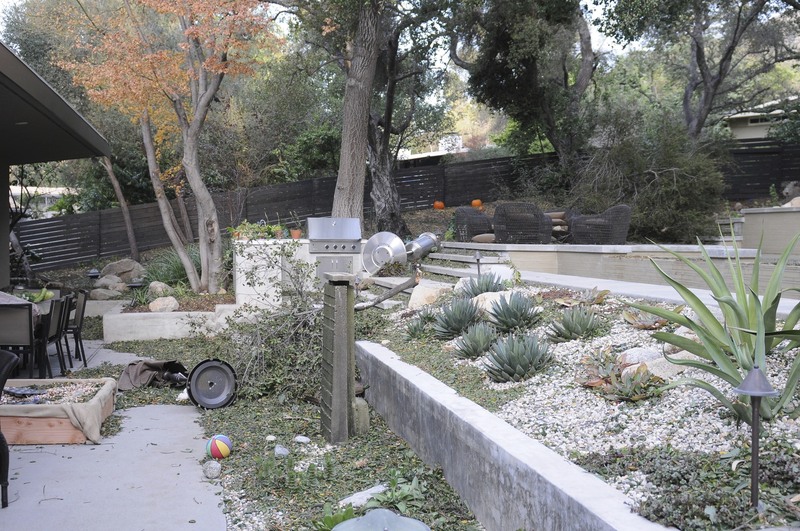 On November 30, 2011, a low pressure system descended on Southern California and caused extremely fierce Santa Ana winds to funnel down out of the mountains, through the canyons, picking up velocity as the denser cool air raced down the foothills into our neighborhood. 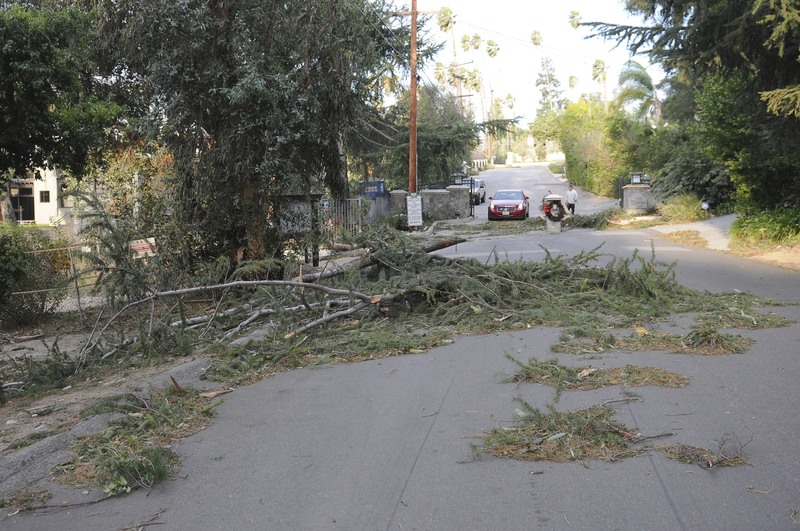 Pasadena was hit particularly hard. The local fire station chief indicated they clocked winds at more than 140 mph and we experienced sustained winds in excess of 75 mph for more than 8 hours. 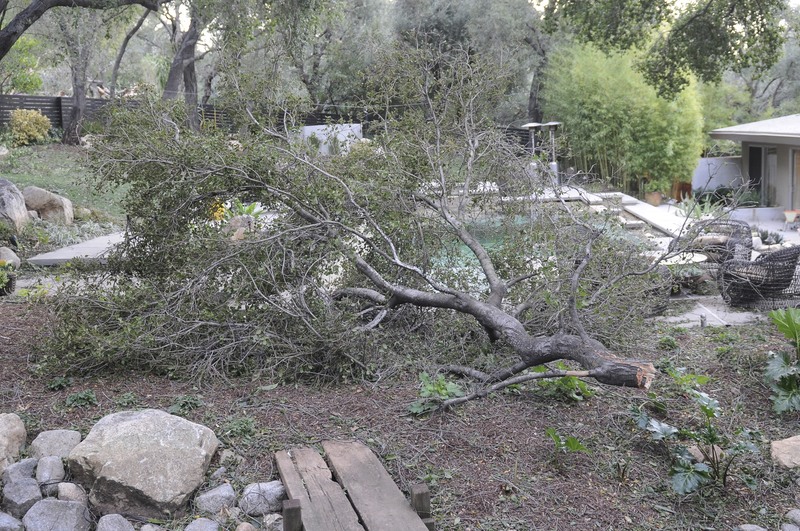 Fortunately, we had pruned our larger Eucalyptus trees a few weeks before, and we escaped the windstorm without much damage (relatively speaking). Our neighbors were not so fortunate, as you will see. Here are photos taken December 1 (captions below each photo). 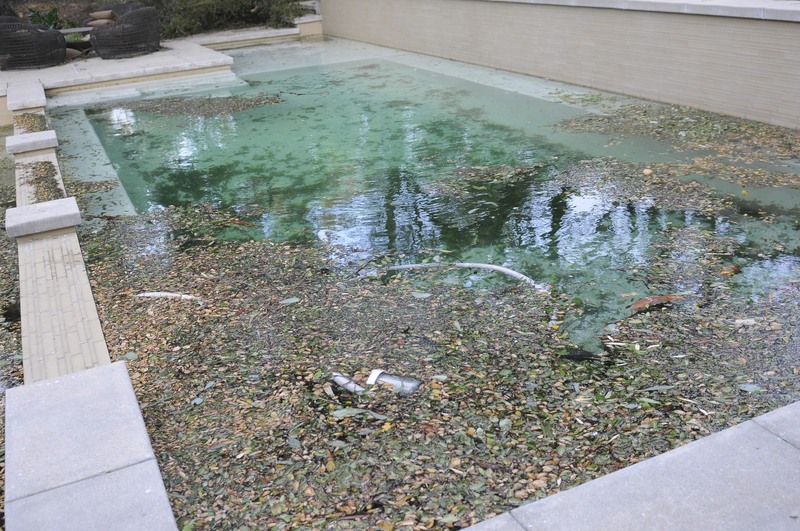 View of the main back planter with debris, umbrellas, propane heaters and the like scattered about. The winds were strong enough to pick up an umbrella holder that weighs roughly 35 pounds and deposit it into the pool below this deck. One of our larger pines shed a few very large branches, including these. One such branch fell onto the electric lines, knocking out electricity in our neighborhood for 6 days. (Sorry!). If you thought at this point that it didn’t look too bad, here is a good example of an experience that was rendered upon literally 1000s of trees in Pasadena. This Eucalyptus was about 140 feet tall, with a base trunk diameter of approximately 5 feet. The tree was just steps away from my 90+ year old neighbor’s front door. If you click on this image — you will see more of the tree relative to the house. 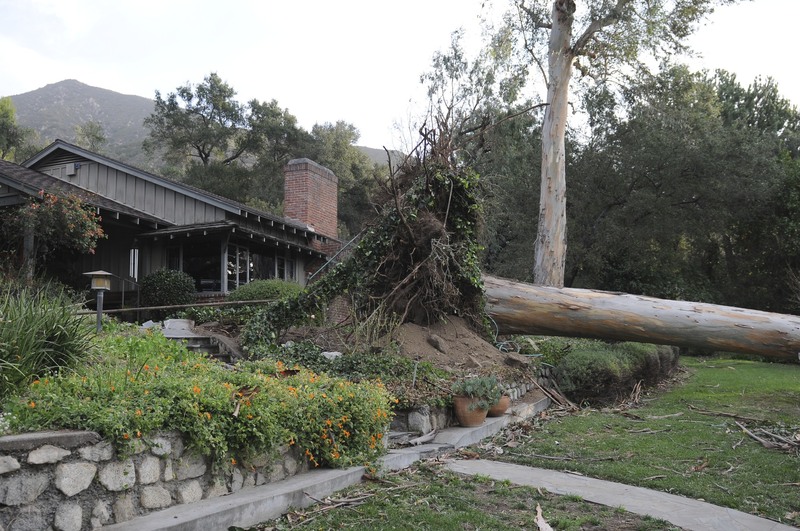 Good thing trees fall downhill and that this house was uphill. (Some homes in our neighborhood were not so lucky — but thankfully we are not aware of anyone being injured). Here is the rootball of the neighbor’s downed Eucalyptus. 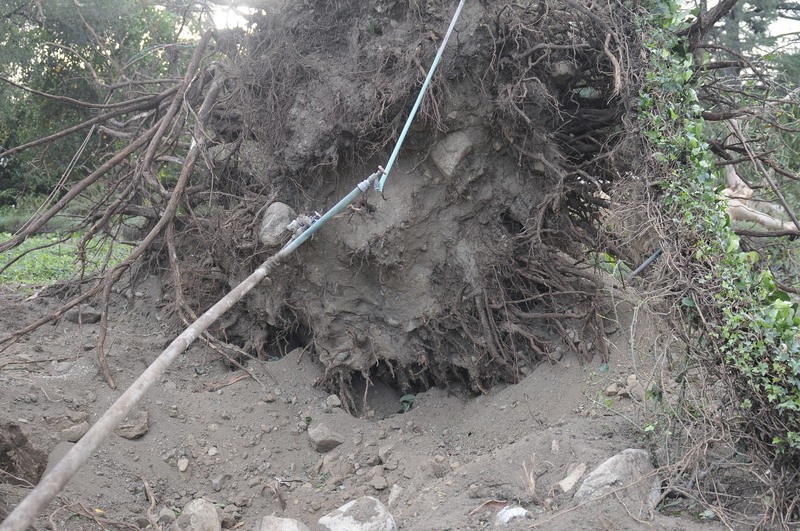 One lesson we learned — when you hire a crew to remove downed trees, they generally won’t remove large root systems like this — so, what is an elderly gentlemen and his wife to do to solve this? We are still figuring it out. 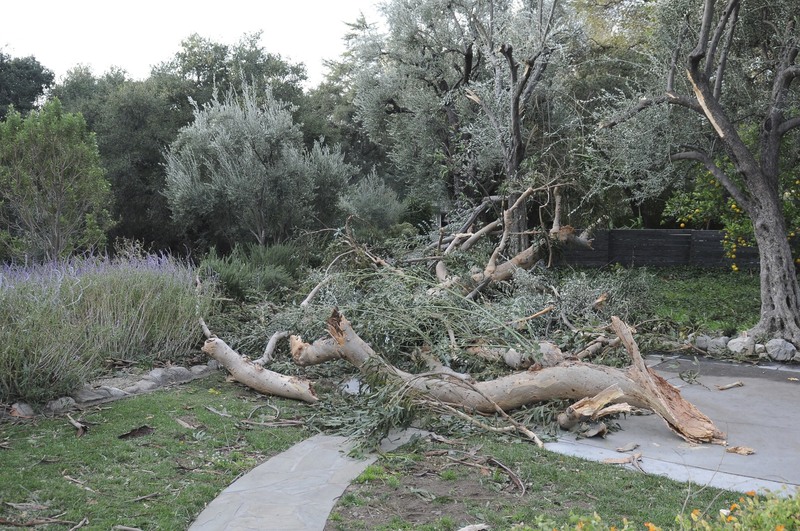 In the upper right portion of this photo, you will note the damage to the olive trees. Debris everywhere. 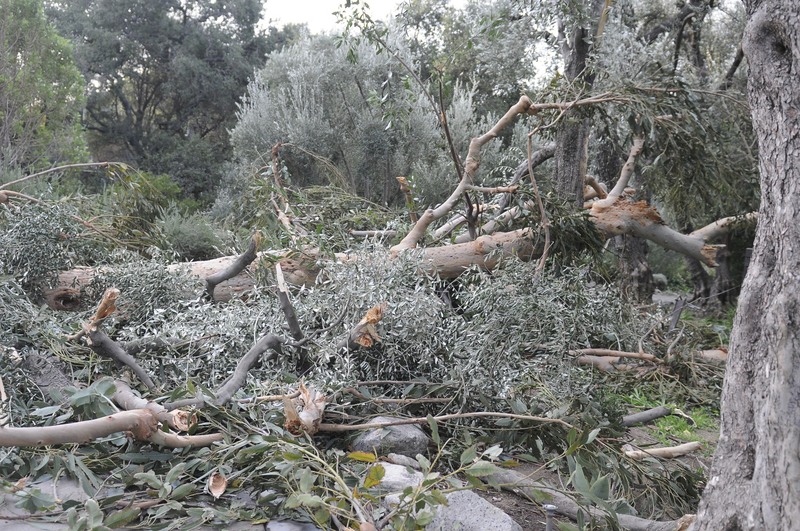 Just along our street, we counted more than 10 downed Eucalyptus trees — each of which was over 100 feet tall and 100 years old. 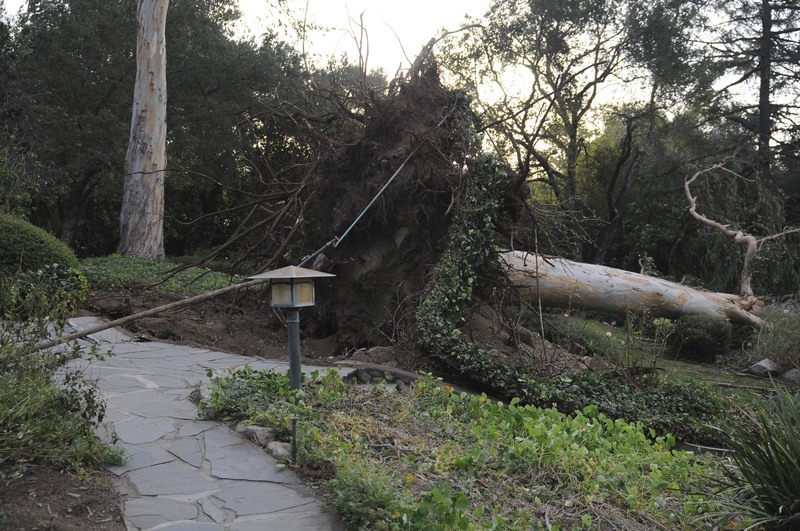 The Eucalyptus and Pines suffered the most damage. The Oaks in our neighborhood survived mostly unscathed — another indication that trees which are native to the region have learned to adapt to whatever mother nature thrusts upon us locally.